« NBN Flux: Why Even? The proposed EastWest Link, a partially underground toll road through the inner north and inner west of Melbourne has been controversial to say the very least. 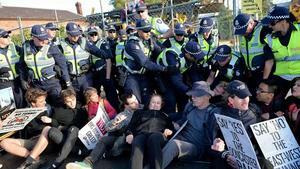 Countless protests against the proposal have ended in scuffles with police, and even attempts by the Victorian government to subvert otherwise legal protest activities. I – (like many other people) – believe that the proposed Melbourne Metro Rail Tunnel is a far more pressing need to improve transport infrastructure in Melbourne. I don’t think that EastWest Link is ultimately a “bad thing”, but the lack of transparency and public consultation around the project has raised the ire of many, but the rail project should surely happen first. Even the long-term Network Development Plan prepared by the government demonstrates the benefits of getting the rail network changes into place. You don’t relieve road congestion by giving more vehicles more places to drive. You relieve road congestion by getting people to leave their cars at home and travel in more sustainable ways. Like by rail, but I digress. I noted yesterday that transport minister Terry Mulder has been in the media speaking of the second stage of the link. The first – (controversial) – stage runs from the end of the existing Eastern Freeway in Clifton Hill, through to Footscray Road in port area of Melbourne. The second stage would then run initially through another tunnel underneath the inner western suburbs, eventually to meet up with the Western Ring Road in the West Sunshine area. The thing that I find curious here is that in between the two stages, what will ultimately be two separate freeways/tollways there really isn’t a significant link at all. The EastWest Link, doesn’t actually link, together. Note that the stage one road – (indicated in pink) – and the stage two road – (indicated in purple) – don’t actually meet up? To get from one stage to the other, you have to rely on Footscray Road. Having lived in Melbourne’s inner west, I know full well that Footscray Road – (and for that matter, Dynon Road a little to the north, and which are both significantly linked to the stage two works) – is a major arterial that is heavily trafficked, particularly in the morning and evening peaks. Commuters travelling by car from the inner western suburbs to the west of the Maribyrnong River to the CBD, already using clogged Footscray and Dynon Roads – (and Footscray Road in particular) – will then have to compete with traffic interchanging between the two stages of the EastWest Link as well. As a road touted as “relieving road congestion”, this seems completely non-sensical. It does appear that traffic flows in the mid-section of Footscray Road will favour the EastWest Link traffic – (given the indicated ramps and off ramps) – but that’s only going to further slow down existing through traffic which has no intention of using either part of the link. How about if we are going to spend billions of dollars building this thing, we do something a little more sensible? 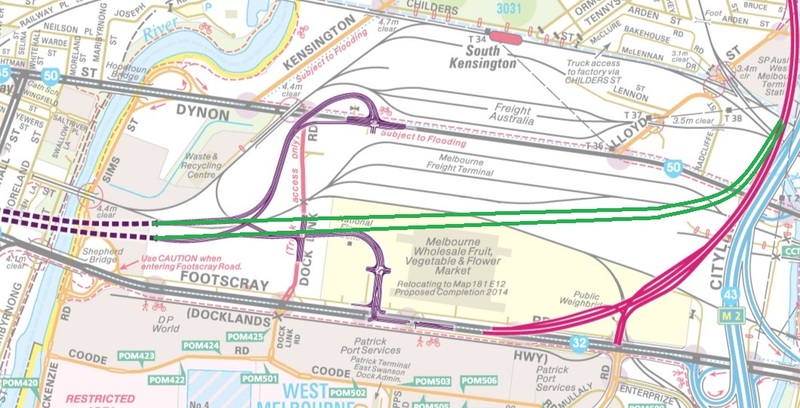 Instead of continuing the EastWest Link down from the Tullamarine Freeway interchange to the north, and onto Footscray Road, lets delete that section, and route the road over the green marked road I have added. You know, actually joining the roads together and actually creating a link between the two? We could even use the on and off-ramps already shown in purple – (with just a little tweaking) – to give access to the ports areas for traffic that wants and needs to use the local traffic area of Footscray Road, and eliminate the need for through traffic from stage one to stage two – (and of course, vice versa) – from having to slow down and negotiate traffic lights to get from one side to the other. Anyone in Melbourne who remembers the first attempt to join the South Eastern Freeway to the Mulgrave Freeway – (to form what is now known as the Monash Freeway) – will know what it is like to have a freeway with traffic lights in the middle of it. Traffic lights existed at Toorak Road – (where the South Eastern Freeway initially finished), High Street, Burke Road, and Warrigal Road – (where the Mulgrave Freeway commenced). It was an expensive and timing consuming mistake to fix. It looks to me like the Linking Melbourne Authority are planning to make the same mistake all over again.